Peyton is just learning to read so I am always on the lookout for a good book to help her become excited about reading on her own. 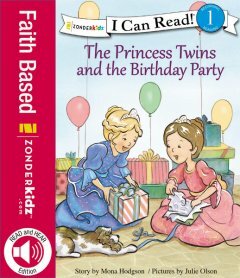 The Princess Twins and the Birthday Party is a level 1 reading which is perfect for those children just learning to read on thier own. I would say the reading level of this book is end of kindergarten or first part of first grade. Some kids maybe more advanced and able to easily read this book before then but from what I’ve seen in my daughter’s classroom I would say her kindergarten class could read this book with some assistance with bigger words. As for the story this is perfect for children that enjoy reading stories about princesses and birthday parties. The main characters of the story are Emma and Abby, twin sisters and princesses. Today just happens to be the twins birthday and they are planning on celebrating with all thier friends with a tea party. We read as the girls get ready for the day and have breakfast with thier parents, the king and queen. At breakfast the girls are given compliments about how pretty thier dresses are given compliments about how kind and beautiful they are inside and out. As the day goes on we see the girls getting ready for the party by putting out place cards for each friend that will be attending the party. But when all the guest arrive they realize one friend is missing. Beth was missing. Emma asked everyone where Beth was and they said she had just been there. Emma looked out the doorway and saw Beth walking away from the party. She rushed after Beth and when she caught up she asked Beth why she was leaving. Beth explained to Emma that she felt her dress was not fancy enough for the party and she did not feel pretty so she was going home. Without hesitation Emma took her crown off her head and placed it on Beth’s head. Instantly Beth perked up and felt like she was now ready for the party. The moral of the story is to be kind. So not only will your child be working on thier reading skills they will also be learning a life lesson. You can purchase The Princess Twins and the Birthday Party on Amazon. This is a perfect book for my granddaughter. She is 6, but she reads everything!! go ahead and give you a shout out from Humble Texas! Just wanted to tell you keep up the good work!